The Trans Adriatic Pipeline (TAP) AG announces that construction in Greece, the pipeline’s greatest geography, advances on time, on track and on budget. Thanks to the efforts of the over 3000 people working for the project, 13 months after the Inauguration Ceremony works have significantly progressed in two of the three northern Greek prefectures to be traversed by the pipeline: eastern Macedonia-Thrace and central Macedonia. 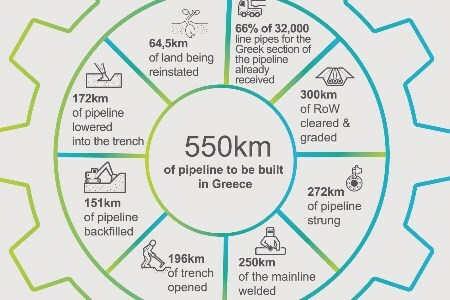 "Over 3000 people working on Greek segment of TAP pipeline"
Received more than 66% of the total 32 000 line pipes to be used for the construction of the pipeline’s Greek section. Cleared and graded almost 300 km of the route. Strung 272 km of pipeline. Welded approximately 250 km of the mainline. 196 km of trench have been opened. 172 km of pipeline have been lowered into the trench. 151 km has been backfilled. 64.5 km of land is being reinstated. TAP AG’s Country Manager for Greece, Rikard Scoufias, said: "I would like to thank every one of the 3,000 people working daily for the construction of the pipeline. Their professionalism, dedication and quality of work ensure the efficient implementation of this big project." Two out of the five engineering, procurement and construction (EPC) contractors operating in the TAP project are Greek companies, namely TERNA S.A. in a joint venture with Renco S.p.A. and J&P AVAX in collaboration with Bonatti S.p.A., while AKTOR has been selected by French contractor Spiecapag as its subcontractor. Also, TAP has awarded CORINTH PIPEWORKS S.A. one of its major contracts for the procurement of line pipes. For the implementation of the project, TAP is collaborating with multiple domestic partners investing millions for goods and services. Overall, 176 companies operating in Greece have already been involved in the implementation of the project – reaping both financial benefits and invaluable expertise. 30 projects supporting improved quality of life for communities located along the routing of the pipeline. Six projects enhancing the livelihoods of local residents. Six projects enabling the cultivation of improved skills and abilities via education and training. Five projects contributing to the improvement of environmental management.